For many reasons I am not cooking lately and when I cook I am craving comfort food; I try to choose the ones that are easy, delicious, and definitely nutritious. Back in the day, one of my housemates was an egg-freak lazy cook and made this dish annoying number of times. Mainly because of that I'd never made spinach with eggs in years. Today, when I realize I was running out of my options for easy and nutritious comfort foods, I remembered it. In Turkey spinach with eggs is usually made with ground meat, however thanks to my boarding school cafeteria I learned to dislike ground meat and try to avoid it as much as possible. Fortunately, this is a very flexible dish; you can make it vegetarian or with ground meat or use beef franks, TVP, or any ground meat substitute you prefer. -Heat butter on low-medium in a skillet that has a lid. -Add onion, red pepper flakes, and ground meat, beef frank, TVP if you are using any. -Stir until ground meat is cooked. If you are having a plain one with no meat, stir until onion is cooked. 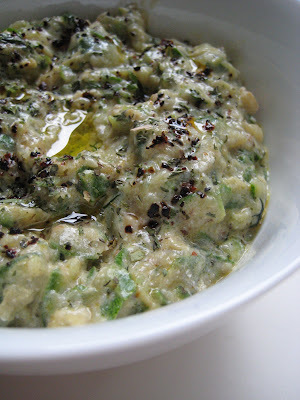 -Add spinach and sauté until spinach is tender and changes color. -Season with salt and black pepper. -Prepare two holes on the spinach bed for eggs. -Break eggs into these holes. -Put the lid on and cook until eggs are cooked. -Serve with crunchy bread. 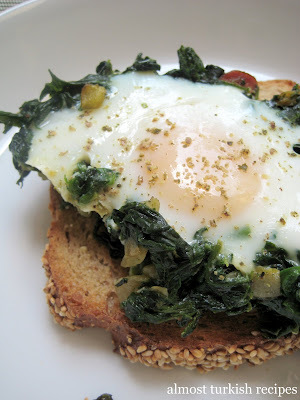 Spinach with eggs is also very good with Tabasco or any spicy sauce on top. I really like this dish too. It is very simple to make and delicious. It all looks so good, especially the bread that it's on. I bet this would be good with a bit of feta. This looks so delicious, Burcu. I just made spinach and egg omelettes yesterday and plan to post on them next week. I'll be sure to link to this lovely dish as well. Cheers! This DOES look great! I was just looking for breakfast ideas. Is that sumac you have sprinkled on top? (even if it isn't, I'm going to put some on mine, as it goes wonderfully with spinach. I won't forget the hot pepper flakes either.) Thanks for the great idea, and I have everything on hand right now too. this is an interesting dish!! 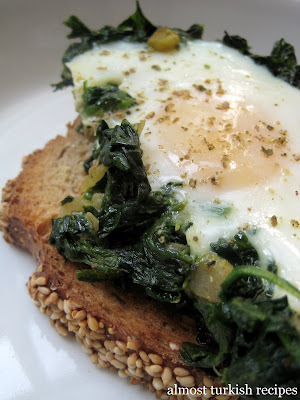 I love spinach with eggs, but haven;t had it for a while. Such a great combination, and healthy too! Great recipe!! The combination is truly fascinating. 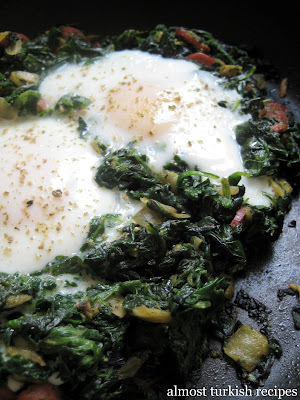 spinach with eggs both are nutritious and good for health. So both combination is likely to be tasty and healthy alike. thank you for shearing your post. Thanks so much for posting! I return to this page often for this healthy, easy recipe. Cheers from one Burcu to another!